Shell abandons offshore Arctic oil drilling: The Monday Slatest. 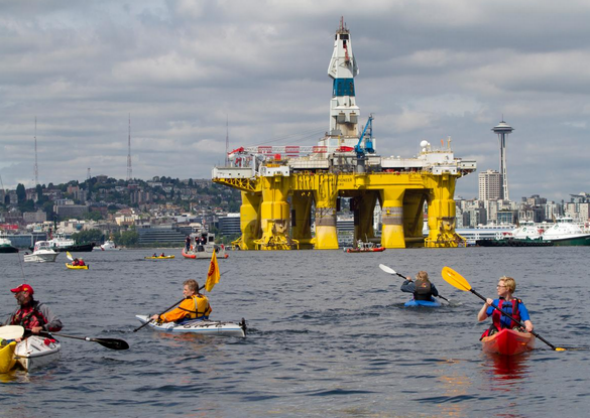 Environmental activists in kayaks protest the arrival of the Polar Pioneer, an oil drilling rig owned by Shell, on May 14 in Seattle. Hello, Slatest readers! Here’s what’s news on the Internet and in the real world on Monday. Shell announced that it would cease offshore drilling in the Arctic in what Slate’s Eric Holthaus described as a “stunning reversal” and a huge win for environmentalists. President Obama, speaking at the United Nations, said the U.S. is willing to work with Russia to end the war in Syria but that Bashar al-Assad must go. Vladimir Putin, speaking at the United Nations, implied that the U.S. is ruining the world, especially in Syria. A new Pew report said that the share of foreign-born American residents is reaching levels not seen since the turn of the previous century. U.S. gun violence continued under the blood moon. Jeb Bush’s top donors allegedly told him to shape up in the polls or ship out of the 2016 race. Bobby Jindal denied that he is dropping out of said race. And the pope seemed to carefully endorse government officials’ right to Kim Davis-style “religious freedom” protests.